The February 2011 Christchurch earthquake (magnitude 6.3) inflicted crippling damage on the Christchurch Cathedral which was the symbol of city. In response to this situation, we were asked to design new temporary cathedral. Paper tubes of the equal length and 20 ft containers form triangular shape. Since geometry is decided by plan and elevations of the original cathedral, there is a gradual change in each angle of paper tubes. This cathedral, which has a capacity of 700 people, can be used as an event space and a concert space. There was a media conference in Christchurch on 31st of July, 2011. 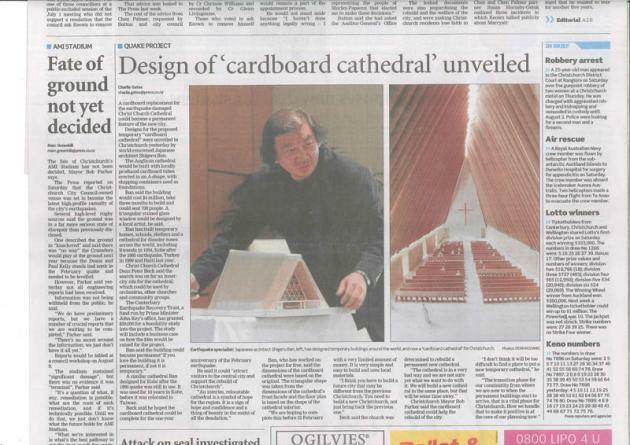 We aim to open cardboard cathedral in February, 2013." "The rhizomatic model presents a problem for the dominant systems of capitalism in place in the global economy and the behavior of capitalism in general. According to Deleuze and Guattari, the function of a capitalist system is a schizophrenic behavior which encompasses the 'decoding' and 'deterritorializing flows' of breaking down existing systems of society such as church or family in order to extract the maximum amount of capital and then instigate 'their violent and artificial reterritorialization' through 'ancillary apparatuses' of capitalism such as the government or corporate bureaucracy which reterritorialize grouped elements to extract an even larger share of capital.2 Like any other system within its reach, the capitalist machinery attempts to behave in this schizophrenic manner with regards to the internet. The rhizomatic nature of the internet, however, allows certain anti–capitalist groups to ward off the capitalist machinery on the net due to the particularly advantageous characteristics of the rhizome for these minority factions." 2). Amanda Wasielewski (2005). 'The Antidote to Capitalist Power: Rhizomatic Networking on the Internet as a Framework for the Success of Anti–Capitalist Minority Groups Against the Schizophrenic Capitalist Machinery'. "For the youngster entering the workforce, work equals learning equals work. Because the new economy is knowledge–based and learning is part of day–to–day economic activity and life, the firm becomes a school in order to compete. Evidence for this is articulated in the little known but very stimulating book The Monster Under the Bed by Stan Davis and Jim Botkin. The book argues that education, once the province of the church, then the government, is increasingly falling to business since it is business that ends up having to train knowledge workers. Say Davis and Botkin, 'With the move from an agrarian to an industrial economy, the small rural schoolhouse was supplanted by the big brick urban schoolhouse. Four decades ago we began to move to another economy, but we have yet to develop a new educational paradigm, let alone create the 'schoolhouse' of the future, which may be neither school nor house.'"